I just beat dino's and I tried all the options. In the end a combined approach seemed to work best. It will be more challenging with your corals but a supper short light cycle might work. After going the Pods and Phyto route I never had to do anything else. 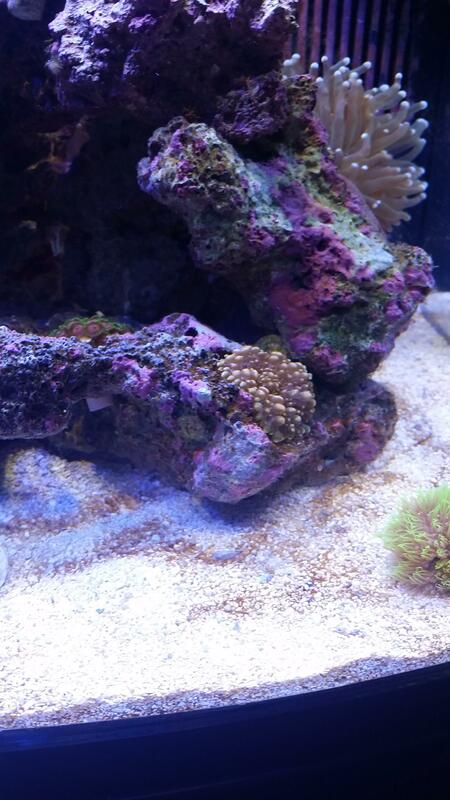 You should dose calcium and alkalinity if you have stony corals. Soft corals can tolerate a broader range of conditions. Definitely. I think most people here world agree, no more water changes. My Dino's have been gone for about two weeks now, and I'm still not doing water changes. Dosing h202 for 5 days did not work for me. Blood shrimp was affected. He is still alive, but his tentacles look like they were inserted into an electrical outlet. Massive dosage of pods and phyto. Have not done a water change in 2 1/2 weeks. Dinos have been stable (not increasing or decreasing). If pods and phyto do not work. Will remove entire sandbed and work from there. One molt and the shrimp will be fine. Removing the sand bed was "turning the corner" for me. Pods and phyto was the "nail in the coffin". This thread has been a lifesaver for me, almost literally. I've been battling Dinos for years and havent known much about them or what I could be doing until I found this thread a few months ago. Last time (2014) I was about to give in after 10 years of this hobby and losing different battles, many times b/c of Dinos. Instead I completely broke down my 220g setup to start fresh one last time. I bleached, acid washed the tank and live rock, and put in a brand new deep sand bed. Things went very well, lost a few chromis which is always expected. In March or so I added my first piece of life from a LFS, one I trusted and still do. I placed a piece of their Live Rock in my tank to help with biodiversity. Then, in April, 6+ months in..DINOS ARE BACK!!! 1) I suffer from CTO (Clean Tank Obsession") I've had so many troubles in the past with algea and dinos and cyano. Always assumed all of them were 100% a result of excess nutrients. So back in 2014 when I had my last outbreak, the Dinos covered EVERYTHING! I have a crazy picture somewhere. I battled it with: excessive water changes and tons of GFO. Now looking back Im not surprised it got so bad. As a result Ive always been obsessed with keeping nutrients so low, removing any extra waste, skimming, skimming, skimming, and using GFO. 2) Now looking back I've gained some clarity. I started thinking right before the Dinos appeared and things were going so well, I noticed an excess of algae on my sand, some cyano. So the panic button hit and I immediately started doing a bunch of WCs and running GFO. I think right after that my Dinos appeared. I now know better. Through this thread I've learned the importance of balance in nature and our tanks! In a matter of days I noticed a difference! Progression halted immediately. And what I had started to die back. I'd say in a few weeks it was almost gone. 6) Added more life: i already had a fuge with chaeto and pods, etc. But now I feed the fuge and the pods are going nuts. I trimmed back the chaeto to allow new growth. and have since doubled my fish population. Also dosed phyto for about a week or so. As of today I'm virtually dino free!!! Just some small matter that's brown and dying off I guess. And I've noticed an increase in activity from the small worms and stuff in my sandbed and fuge. And also more reproduction in my snails which had almost halted. Hope that's helpful and not too much detail. I really believe this thread not only saved my tank but single-handedly kept me in this hobby. I'm sure this isnt the last I will see of these horrible Dinos. But know I feel armed with a plan of attack. And as I mentioned, have a much better appreciation for balance in this hobby. Wow. Mine started much the same way back in March. Perfect tank. Beautiful purple rocks lol. Baby was born in May. Spent a week at the hospital. And bam. Dino's. Did massive water changes and it's worse!!! I've stopped water changes. Run socks. But can't let go of my skimmer. Dino's still there. Tiny tiny bit better. Wired most of my turbo snail population died. Weird eh. @Cyberdude Congrats on the new baby! Dinos are famous for killing snails. They are the organism responsible for 'red tides' and a lot of shellfish poisoning/killer diarrhea in the wild. I thought I had 'new tank algae' until all my snails died within a week. Stop doing water changes! Add a big bunch of pods if you can. Once all dinosaur are gone. When would you assume is a safe time to do water change? If I ever get rid of this and it comes back, I'm giving up. Hell no would I battle this again. Yes, her tank had lots of hair algae, but also lots of copepods, and I am seeing a good amount of Flatworms also. Could Flatworms be a possible fighter of the dinos? I really believe this thread not only saved my tank but single-handedly kept me in this hobby. I'm sure this isnt the last I will see of these horrible Dinos. But know I feel armed with a plan of attack. And as I mentioned, have a much better appreciation for balance in this hobby.